It looks like this week’s theme is moving and escape. The problem is that that is a yes/no one-year measure, and it’s difficult to see the significant moves. 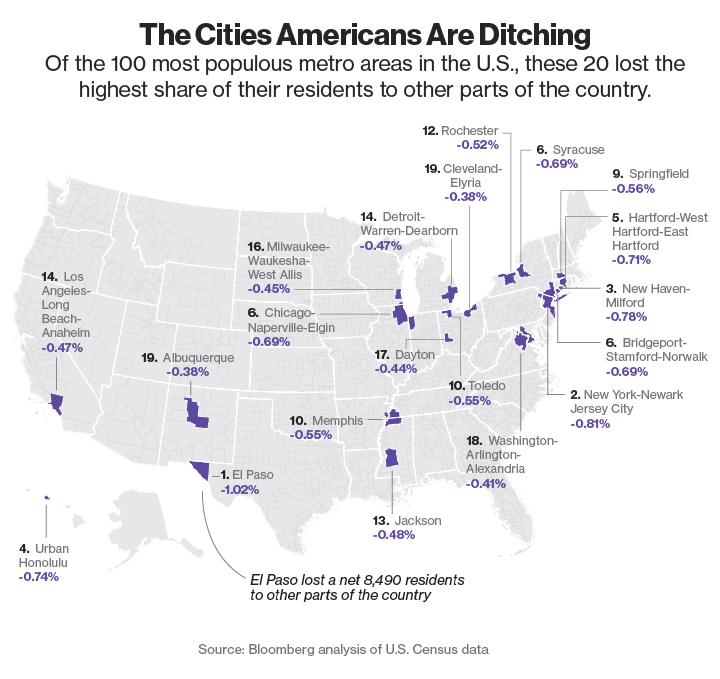 One thing to note is that even as U.S. residents left these places, they did not necessarily have population reductions. In addition, not all of Manhattan is equally expensive, and most especially not all of New York City is equally expensive. I used to live in Manhattan (3 years) and then Queens (8 years). In both places I lived, there was extremes of living conditions within just a couple blocks of each other. I was pushed out of Manhattan as I did not have a rent-controlled apartment, and the NYU trust funders were bidding up East Village prices. The old folks in my 6-story walkup did not get pushed out by rents that were $1400/month when I left in 1999. We were at the southeastern end of Main Street in Flushing, the northwestern end being in Koreatown, unsurprisingly chock-full of Korean (and other) immigrants. Koreatown was much cheaper. My point is that lots of these places, through extremely dense residential areas, have a mix of low-cost and high-cost living. There’s not much in the middle. I mean, my 2-bedroom apartment was in the middle, but I moved out to Westchester when the youngest of our 3 kids was 1 year old. It was the matter of an opportunity, but we were going to be moving at some point. When the kids are small, you can stick them in a drawer, but as they get larger (and smellier), one wants a bit more room. In any case, many of these cities are, and have long been, places of transience. New York City is notorious for this — few people living there are actually from there. You’re expected to move on somewhere else if you grow up there. I wonder where those people went. Of course, they lost “only” 8.5K people, which is large for such a small place (it would be a rounding error for NYC). The problem, of course, is that while there is some context to the numbers, it’s hard to gauge what the real magnitude of these changes are. So -0.45% change in U.S. residents on net? Is it all that bad? One year changes tend to be too small to detect. I’m going to be extremely simple-minded and extrapolate these percentage changes to a decade, treating this like a compound annual growth rate. To be sure, I bet there’s lots of fluctuations, but let me do just a few points. Now, mind you, this is extrapolating from a one-year trend, and I’d really like to see longer periods of time. In addition, this is just net migration of U.S. residents. This does not include the effects of immigration, deaths, and births. The crude death rate for the U.S. is 0.8%, which is on a par with the one-year New York outmigration. The crude birth rate for the U.S. is 1.3%, which is higher than any of these net outmigration numbers. I’m not going to even try to figure out immigration rates right now, because, even though like births and deaths they are uneven across the U.S., the locations of immigration are much more skewed than births/deaths. So yes, I think the theory that many Americans leave urban areas due to costs is plausible, but also because it’s so much nicer living in suburbia.